You can draw attention to parts of an image by zooming into a portion of the image and enlarging it on the screen. 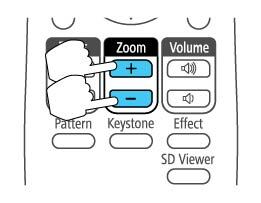 Press the Zoom + button on the remote control. You see a crosshair on the screen indicating the center of the zoom area. Use the arrow buttons to position the crosshair in the image area you want to zoom into. Press the Zoom + button repeatedly to zoom into the image area, enlarging it as necessary. To pan around the zoomed image area, use the arrow buttons. To zoom out of the image, press the Zoom – button as necessary. To return to the original image size, press Esc.